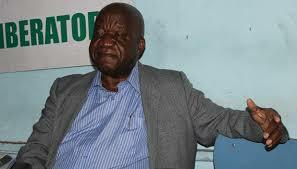 Veteran politician — Callistus Ndlovu who was booted out from the provincial executive for undermining the authority of former first lady Grace Mugabe in 2014 — has bounced back to assume his Bulawayo chairmanship post following a recent shake-up in Zanu PF. This follows the stunning sacking of Mugabe and his wife from Zanu PF by the party’s Central Committee on November 19, in events which eventually led to the 93-year-old’s resignation from being the country’s leader. Ndlovu was re-instated as Bulawayo’s chairman at a Provincial Co-ordinating Committee (PCC) meeting held at the party’s Davies Hall offices. Makokoba Member of Parliament and former War Veterans minister Tshinga Dube who was one of the senior party officials at the meeting confirmed the development to the Daily News yesterday. “We had a PCC meeting which was chaired by Callistus Ndlovu, he is now the provincial chair. “The former chairperson Dennis Ndlovu was only there as a caretaker so we resolved that Ndlovu retains his position as our chair,” Dube said. “We also resolved that all those who were expelled or suspended by the party during that era of factionalism be reinstated,” he added. Following the expulsion of Mugabe, his wife and party heavyweights such as political commissar Saviour Kasukuwere and secretary for administration, Ignatius Chombo, Zanu PF has moved in to reconfigure the provincial executives ahead of next month’s congress. Zanu PF has re-instated all the party chairmen and youth leaders who were expelled at the behest of Kasukuwere during the ugly tribal, factional and succession fights which were brought to an end by the intervention of the military on November 15. Dube said those who had assumed leadership of the province on the G 40 ticket had been spared the axe but reassigned to hold lesser influential roles. “We agreed that we are not going to expel anyone from the party anymore but we said all those who were linked to G40 and took part in destabilising the party should not be allowed to hold any senior position in the party and government,” Dube said. Among the casualties of the changes are Dennis Ndlovu who was the provincial chairperson, MPs Killian Sibanda and George Malaba. The provincial youth league dissolved the whole executive which had been imposed by Kasukuwere. This included former leader, Anna Mukoghla, one of the three youth leaders who are said to have fled to Botswana and South Africa, respectively, when it became apparent that the G40 cabal had fallen and that some of the kingpins had already been captured by the army. “It’s true that some youth leaders ran away and also that they now have a new executive in place as we try to strengthen the party going forward,” Dube confirmed to the Daily News.